Tourists can find events in Rome any time of year because there's always something going on. While Easter is a popular time for tourists, there are plenty of secular and cultural events to intrigue even the most seasoned traveler. Here's a month-by-month list of some of the biggest events in one of the most captivating cities in the world. New Year's Day is a national holiday in Italy. Most shops, museums, restaurants, and other services will be closed so that Romans can recover from New Year's Eve festivities. Jan. 6 is Epiphany and Befana. Epiphany is officially the twelfth day of Christmas and one on which Italian children celebrate the arrival of La Befana, a good witch. In Vatican City a procession of hundreds of people dressed in medieval costume walks along the wide avenue leading up to the Vatican, carrying symbolic gifts for the Pope who says a morning mass in Saint Peter's Basilica for Epiphany. Jan. 17 is Saint Anthony's Day (Festa di San Antonio Abate). The feast celebrates the patron saint of butchers, domestic animals, basket makers, and gravediggers. In Rome, this feast day is celebrated at the church of Sant'Antonio Abate on the Esquiline Hill and the traditional "Blessing of the Beasts" that accompanies this day takes place in the nearby Piazza Sant'Eusebio. Depending on the date of Easter, the beginning of Lent and Carnevale may begin as early as Feb. 3. Carnevale and Lent are among the most exciting times to be in Rome, as both the pre-Lenten festivities (Carnevale) and the religious processions, which begin on Ash Wednesday, are part of the tradition in the capital and the Vatican City. Carnevale events in Rome start ten days before the actual Carnevale date, with many events taking place in Piazza del Popolo. The Festa Della Donna or Women's Day is celebrated on March 8. Restaurants in Rome typically have special Women's Day menus. On March 14, also known as the Ides of March, Roman's mark the anniversary of Julius Caesar's death in the Roman Forum near his statue. Easter, which usually falls in March or April, is one of the busiest times of the year in Rome and Vatican City, with many religious events to mark the death and resurrection of Jesus in the Christian church. The events culminate with an Easter Mass in St. Peter's Square. Then later in March, the annual Maratona di Roma (Marathon of Rome) takes place in the city, with a course that takes runners past the ancient city's most famous monuments. Like Easter, the day after Easter, La Pasquetta, is also a national holiday in Rome. Many Romans celebrate with day trips or picnics outside the city, and the day ends with fireworks over the Tiber River. The Festa della Primavera, a festival which marks the beginning of spring, sees the Spanish Steps decorated with hundreds of pink azaleas. In mid-April, Romans mark the Settimana della Cultura or Week of Culture. National museums and archaeological sites have free admission and some sites not normally open to the public may be open. The Founding of Rome (Rome's Birthday) is celebrated on or near April 21. Rome is said to have been founded by the twins Romulus and Remus in 753 BC. Special events, including gladiatorial displays at the Colosseum, are part of the festivities. And on April 25, Romans mark Liberation Day, the day Italy was liberated at the end of World War II. Commemorative ceremonies are held at the Quirinale Palace and other places across the city and country. Primo Maggio, May 1, is a national holiday in Italy marking Labor Day, the celebration of workers. There's a concert in Piazza San Giovanni, and usually, protest rallies as well. Most sites and museums are closed, but it's a good day to take in some of the open-air sites in and around the city. A new group of Swiss Guards is sworn in at the Vatican every May 6, the date that marks the sack of Rome in 1506. The general public is not invited to this ceremony, but if you can coordinate a guided tour of the Vatican that day, you may be able to catch a glimpse of the swearing-in. Sometime in early or mid-May, Rome hosts the Internazionali BNL d'Italia, also known as the Italian Open, at the tennis courts at Stadio Olimpico. This nine-day, clay court event is the largest tennis tournament before the Grand Slam French Open tournament and attracts many major tennis players. Republic Day or Festa della Repubblica is celebrated June 2. This big national holiday is akin to Independence Days in other countries, commemorating the date in 1946 that Italy became a Republic. A huge parade is held on the Via dei Fori Imperiali followed by music in the Quirinale Gardens. Romans celebrate numerous religious holidays in June, including Corpus Domini, 60 days after Easter Sunday, the Feast of St. John (San Giovanni) on June 23, and Saints Peter and Paul Day on June 29. The Expo Tevere arts and crafts fair extends along the banks of the Tiber from Ponte Sant'Angelo to Ponte Cavour, with artisan food stands to sell wines, olive oils, and vinegar. It's scheduled in early to mid-July and is a great place for tourists to purchase authentic Roman wares. During the last two weeks of July, the Festa dei Noantri (which translates as "Festival for the Rest of Us") is celebrated, centered around the Feast of Santa Maria del Carmine. This very local festival sees the statue of Santa Maria, adorned in handmade finery, being moved around from church to church in the Trastevere neighborhood and accompanied by bands and religious pilgrims. Throughout July and August, there will be music concerts at the Castel Sant'Angelo and other outdoor venues, including Rome's squares and parks and the ancient Baths of Caracalla. The Festa della Madonna Della Neve ("Madonna of the Snow") celebrates the legend of the miraculous August snow that fell in the 4th century, signaling the faithful to build the church of Santa Maria Maggiore. A re-enactment of the event is carried out with artificial snow and a special sound and light show. The traditional beginning of the summer holidays for most Italians is Ferragosto, which falls on the religious holiday of the Assumption, Aug. 15. There are dance and music festivals on this day. The summer heat begins to subside in September, making outdoor activities a little more pleasant and public places a little less crowded with tourists. In early September, the harvest festival known as the Sagra dell'Uva (Festival of the Grape) is held at the Basilica of Constantine in the Forum. During this holiday, Romans celebrate the grape, a food which is a huge part of Italian agriculture, with large bushels of grapes and wine for sale. And early September is also the beginning of football (soccer) season. Rome has two teams: AS Roma and SS Lazio, rivals who share the Stadio Olimpico playing field. Games are held on Sundays. Late September sees numerous arts, crafts and antiques fairs across Rome. In October, Rome sees many arts and theater events, along with one big religious celebration. The Feast of St. Francis of Assisi, on Oct. 3, marks the 1226 anniversary of the Umbrian saint's death. Romans celebrate with a wreath-laying near the Basilica of San Giovanni in Laterano. Since 1976, The Rome Jazz Festival has attracted some of the top jazz musicians from around the world. It used to be held during the summer but is now in late October, at the Auditorium Parco Della Musica. On Nov. 1, All Saints is a public holiday when Italians remember their deceased loved ones by visiting graves and cemeteries. The Roma Europa Festival is ongoing throughout the month of November. The program has a wide variety of performance art, contemporary dance, theater, music, and film. And the young but thriving International Rome Film Festival in mid-November takes place at the Auditorium Parco Della Musica. On Nov. 22, Romans celebrate the Feast of St. Cecilia at Santa Cecilia in Trastevere. During Hanukkah, Rome's large Jewish community look to Piazza Barberini, where candles on a giant menorah are lit each evening. Christmas in Rome begins in early December, as Christmas markets start selling handmade gifts, crafts, and treats. The nativity display in Sala del Bramante near Piazza del Popolo features nativity scenes from around the world. On Dec. 8, the feast of the Immaculate Conception, the Pope leads a caravan from the Vatican to Piazza di Spagna, where he lays a wreath at the Colonna dell'Immacolata in front of Trinita dei Monti Church. Christmas Eve is the night when nativity displays are traditionally completed by adding the baby Jesus or are unveiled, such as the life-size nativity in Saint Peter's Square. On Christmas Day, most businesses are closed, but midnight mass at St. Peter's Basilica is a unique Roman experience, even for those who are not practicing Christians. And just as it is all over the world, New Year's Eve, which coincides with the Feast of Saint Sylvester (San Silvestro), is celebrated with much fanfare in Rome. 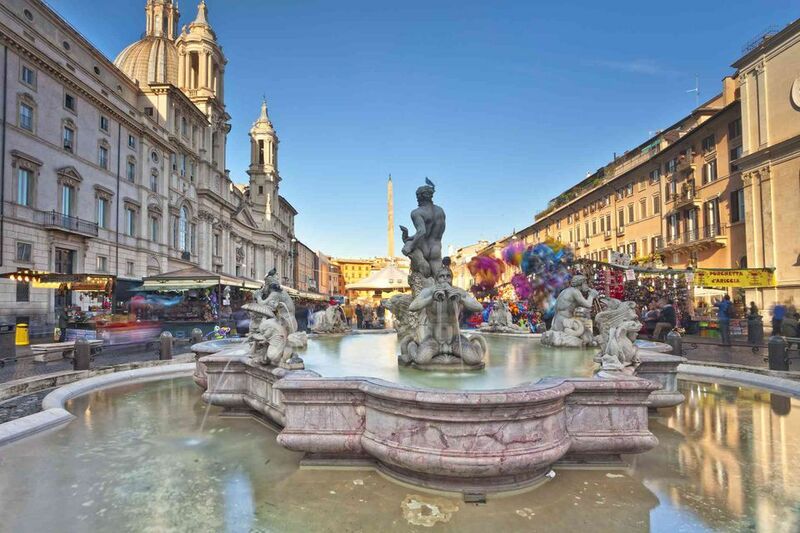 Piazza del Popolo has the city's biggest public celebration with music, dancing, and fireworks.